I know of a large German American Catholic family consisting of 22 single-birth children born to one married couple. The “children” are now middle-aged. At a recent reunion, over 100 family members were present. This family is not fundamentalist in any way, though one sister is a nun. As far as I know they are purely mainstream (which is not necessarily high praise). I never heard what philosophy motivated the parents, who were farmers, to have so many children. The Most Children Ever Produced by One Mother: 69? Wikipedia helps clarify this entry in the popular record book. It lists  the name of the husband as Feodor Vassilyev, and situates him a century earlier. He is said to have lived c. 1707–1782. Thus, the wife could not have been presented at the court of Czar Alexander II, as Guinness stated; the Czar would have had to have been Alexander I. The two sources are referring to the same individual, because the number of children and other details match. Wikipedia, however, is correct and Guinness wrong about dates, because Wikipedia links directly to the relevant primary source for the information. The online encyclopedia also provides quotations from persuasive authorities suggesting that the information may not be reliable. For example, the proper name, birth and death dates, and other information about the mother are not known. All 69 children allegedly resulted from multiple births, with no single births whatsoever: 16 pairs of twins, 7 sets of triplets, and 4 sets of quadruplets (= 69). It was also an age when high child mortality was the norm, yet 84 of the children of the two marriages supposedly survived, and only 3 died—a suspiciously low number. So it would appear that there is no compelling reason to accept the story of 69 children in this case. Therefore, I don’t know what the correct, verifiable record number of children born to a single mother might be. Certainly, one would have to distinguish between historical examples and modern births involving assisted techniques. Large white families were much more common before the “profound transformation” wrought by the European “demographic transition”  [1:08 mins.] than they are today. Italian demographer Massimo Livi-Bacci  maintains that the tremendous decline in European fertility associated with the Industrial Revolution was due primarily to a large increase in the cost of rearing children compared to the preceding millennia-long agricultural era, which resulted in “voluntary fertility control” through family planning. The rise of mass communications and the dismantlement of social controls formerly imposed by Western laws, traditions, institutions, and religion were also vital in causing a decline in births. Birth control in Europe and other developed regions, Livi-Bacci writes, was once “virtually unknown except to select groups (nobility, the urban bourgeoisie).” But at the end of the 19th century it spread rapidly. It did not reach some rural and peripheral areas until the middle of the 20th century, however. 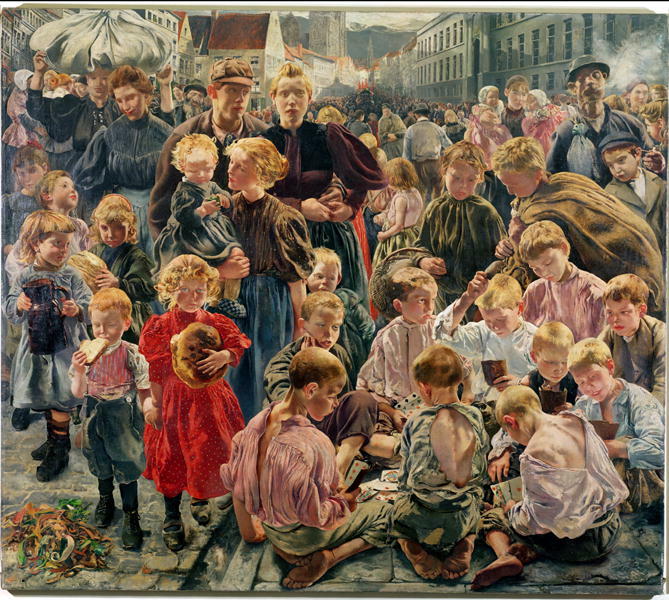 Large families are still the norm in the Third World, as well as among non-whites imported into First World countries to replace the native inhabitants. Therefore, many non-white populations continue to expand at a rapid pace. Their death rate has been slashed by foreign aid and other Western largesse, while fertility rates remain high. Relying upon the prevailing universalistic creed that all races are identical, globalist planners and demographers hypothesize that non-white populations will likewise undergo a demographic transition (huge decline in fertility) in the future. Despite the long-term negative population growth rate among whites, some large white families as well as a nascent natalist ideology do exist. Jon and Kate Gosselin starred in a popular cable TV reality show called Jon & Kate Plus 8 (Kate Plus 8 after their split) from 2007–2011. I have never seen this program. During its first year, the show aired on Discovery Health, a now-defunct cable channel owned by Discovery Communications, Inc., whose CEO is David Zaslav and major investor is the Newhouse family . From 2008–2011 it ran on TLC, another Discovery-owned channel. Kate Gosselin (née Kreider), is one of five children of a pastor. Her (now) ex-husband Jon is reportedly half-Korean and half-white. So the 8 child stars are 75% white and 25% Korean. They were conceived with the aid of fertility drugs, a set of twins first, followed by sextuplets. My impression is that the couple did not expect to have sextuplets the second time around. All of the Gosselin births were premature, the twins at 8 months and the sextuplets at 7 months. As a result, the sextuplets were placed on ventilators. Fertility drugs have a higher likelihood than natural methods of producing multiple births, including increased numbers of twins, triplets, quadruplets, quintuplets, sextuplets, and so forth, as well as premature births. While many or most premature babies survive today, I don’t know whether they suffer any negative long-term aftereffects. The Gosselins appear to be entirely secular. Much tabloid gossip was generated by Jon Gosselin’s affair with the (evidently) Jewish daughter of Kate’s plastic surgeon, the woman’s possible trashing of his apartment, etc. A major reason for the family’s strong appeal to television executives (and viewers) was no doubt its conspicuous display of racial hybridity. The family is a model of multiracialism and non-whiteness; socially, Jon and Kate and their offspring should be regarded as foreign. The gene flow exhibited in this case should be directed away from, not into, the white community. 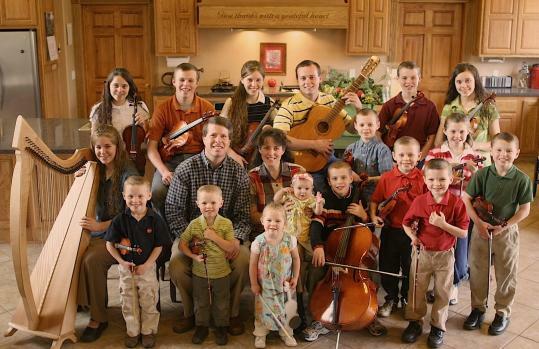 Less famous but more interesting and educational from our perspective are the Duggars, another reality TV show family seen on Discovery-owned TLC, 19 Kids and Counting (formerly 17 Kids and Counting and 18 Kids and Counting) (2008–present). This is another program I have not seen. The parents, described as conservative, fundamentalist Baptists, married in 1984 and practiced birth control. Their first child was born three years later. They resumed birth control, but Mrs. Duggar conceived anyway and suffered a miscarriage. This they interpreted as a religious sign, and thereafter decided to let God determine how many children they should have. From that point on, Mrs. Duggar gave birth at regular intervals of approximately a year and a half. In addition to the first miscarriage, another child was delivered 3 months prematurely via emergency C-section, weighing 1 lb., 6 oz. at birth. This child survived. In December 2011 Michelle Duggar, then age 46, suffered a second miscarriage while pregnant with her 20th child. Of 21 children, 19 of whom survived and two miscarried, two were home birthed and 4 (including 3 of the last 5) were delivered via C-section. The only multiple births were two sets of fraternal twins. Like most natalist Christians, the Duggars do not use fertility drugs. When the couple married in 1984 Mr. Duggar was 19 and Mrs. Duggar 17. Their first child was born when they were 22 and 21 respectively; in 2009, when their 19th surviving child was born, they were 44 and 43. Mr. and Mrs. Duggar adhere to various conservative family practices, including home schooling, which are summarized in their Wikipedia entry . In common with other large Christian families, every child is responsible for helping to raise the younger children. The family lives in Arkansas. The husband, “of English descent,” is in real estate and owns several commercial properties. Mr. Duggar served as a Republican in the Arkansas House of Representatives from 1999–2002. The family is a good example of how ideology (in this case religious belief) can potentially influence fertility decisions even in today’s anti-natalist (at least for whites) environment. Of course, the very sight of the large Duggar family—white and Christian, the two most hated identities in the contemporary world—drives denizens of the fever swamps  crazy. A Google search for “Duggars racist” generates 600,000 hits. Quiverfull (a term derived from Psalms 127:3–5) is an informal natalist movement among some conservative evangelical Christians, mostly in the US, but also in Britain, Canada, Australia, and New Zealand. It is important to note that other Christian families eschew the name but follow similar principles. The core Quiverfull beliefs are that Christians should maintain a welcoming attitude toward large families, and birth control should be rejected. Nevertheless, she worries (or pretends to) that in a generation or two the barbarians might accomplish a “demographic revolution.” However, this appears to be fear and loathing more than reason talking. Joyce of course depicts the movement as racist and antifeminist. Early Quiverfull pioneers were a woman named Nancy Campbell (Be Fruitful and Multiply, 2003), and especially Mary Pride , a former radical feminist who in 1985 published The Way Home: Beyond Feminism, Back to Reality. Interestingly, the Quiverfull movement rejects infertility treatments on Biblical grounds but welcomes large-scale adoptions, thereby opening the door wide to interracialism. Replacement fertility —where each generation exactly replaces the one before it (i.e., equilibrium, or zero population growth—no expansion)—is currently 2.1 children per couple in the First World and 2.4 in developing countries. Because some men and women in each generation do not reproduce, couples who do so must give birth to more than 2.1 children to sustain the overall population level. Actual First World fertility is currently below replacement level (signifying population implosion)—despite factoring in miscegenation, which is now substantial, and the high birth rates attributable to permanently-settled non-whites, whose numbers under existing policies are continuously augmented by new arrivals, legal and illegal, at a ferocious pace. Note that Livi-Bacci is saying that these disparate extremes exist now. Whites are clearly on the losing end. Observe too the tremendous velocity built into the numbers. Race is not static. Not only are Christians not explicitly white, they are effectively anti-white. Race either plays no role in their thinking, or members actively reject white identity—but not Jewish, black, or other politically correct expressions of racism. I assume this is the result of cultural conditioning rather than religion. At least that’s what history would suggest. Unlike Jews, Christians have no racially exclusive membership criteria, or explicit, effective barriers to, or admonitions against, interracial marriage. When pressured, they will doubtless strive, like the Mormons, to dilute their racial makeup in hope of destroying its “too white”-ness. Thus, Christianity as formulated and practiced in the contemporary non- and anti- white world will never preserve our people. Even if it can sustain itself religiously, which remains to be seen, it will self-destruct racially because Christian whiteness is viewed as a purely incidental, and probably undesirable, attribute. Racially, the Duggars and others like them are already the Gosselins. It’s simply a matter of time. However, large natural families like the Duggars or the German American family I mentioned at the outset are concrete examples, or models, of how population expansion, under current conditions or within a white ethnostate, can begin. The higher the total fertility rate , the quicker population recovery can occur. The individuals and movements discussed here demonstrate concretely how natalism could work for anyone, right now, in practice. Christian natalists are altering their lifestyles and behavior without possessing a state of their own, separating themselves and their families now—ideologically, psychologically, behaviorally, and educationally (via home schooling) in ways that conscious whites have yet to match. The good news is that there is a substantial amount of cumulative experience, information, and guidance for young whites to draw upon should they choose this path. Like their forebears and contemporary “quiverfull” Christians, young whites would have to develop faith that they could make it. Perhaps the greatest leap forward has been the huge reduction in infant mortality. In the past as many as one-third to one-half of children born might perish before reaching reproductive maturity. Today, almost all children conceived will survive, even in the largest families. This is something new under the sun, greatly enhancing the possibility of population recovery. Fertility drugs, despite drawbacks, could also prove advantageous. In terms of white survival, concerned families would have to develop, sustain, and transmit across successive generations a powerful sense of individual and group identity effectively rooted in whiteness. The primary problem for whites, as for Christians, is the powerful undertow produced by a deeply hostile, all-intrusive, one-sided culture capable of nullifying all of their hard work. Defection and intergenerational attrition is likely to remain high as long as control of the culture and government remain in alien hands. The siren call of the sewer, the gutter, and the mass will remain stronger than culturally transmitted family values for a long time to come.